This was the dish that came with the burnt chicken. Yet it survived like we did, a little worse for wear, but still delicious. 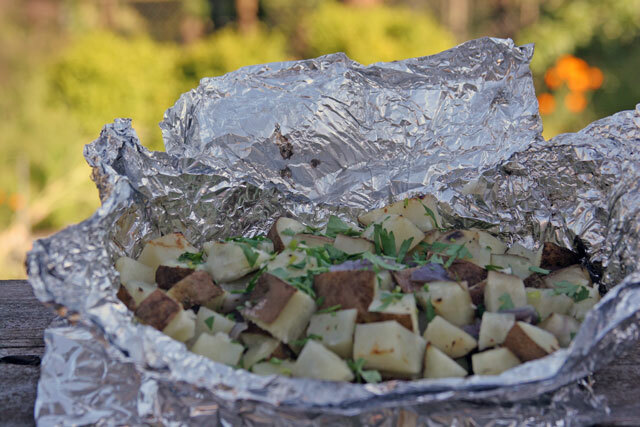 Grilled potatoes in foil is a staple for outdoor cooking. I love that I can make an entire meal outside. This is short and sweet, no lessons for this one. 1. Place the potatoes in a bowl, toss them with olive oil, 1 teaspoon salt, and 1/2 teaspoon pepper. Make a large foil paper “pouch”, double up on the foil. Place the potatoes in the pouch, place on the grill over medium heat. Cook for 20-3o minutes. 2. Remove from grill, toss with chopped parsley or cilantro, and lemon juice. I drizzle a little extra olive oil on the potatoes when I serve them. Right?!!! That is exactly what we ate. Thank You for all of your nice comments:).